Public authorities in Denmark register various core information about individuals, businesses, real properties, buildings, addresses, and more. 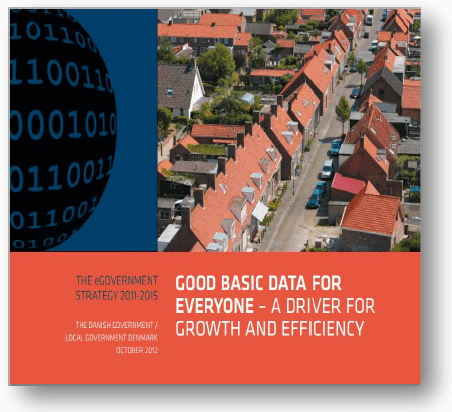 This information, called basic data, is reused throughout the public sector. Public and businesses are provided a better and more efficient service, when data that has already been recorded is shared across institutions and is included directly in case processing. Employees in the public sector will be less burdened by repetitive and routine tasks, and this, in turn, will release more resources for increased welfare in e.g. the healthcare and education sectors. Open and homogenous reuse of basic data also has great value for the private sector, partly because businesses use this data in their internal processes and, partly, because the information contained in public-sector data can be exploited for entirely new products and solutions, in particular digital ones. Eurostat - Directorate-General of the European Commission located in Luxembourg. World Bank Group - International financial institution that provides loans to countries.